Nobody likes counting inventory. Even our co-owner, Jamie, often jokes about his disdain for counting bottles, and he runs a bar inventory company. Let’s face it – regardless of what you are trying to get out of your inventory efforts, counting bottles is the most tedious and least enjoyable part of doing inventory. That being said, it’s also an important component of the inventory process and provides you with a valuable tool to measure the ongoing performance of your business. At Bar-i, our primary goal is always to do a thorough job with the entire inventory process in order to provide you with the actionable data necessary to improve your profitability. However, we also want to get through the boring parts of the process as fast as possible, and there is nothing more boring than spending hours counting bottles. We prefer to spend as much of our time as possible evaluating the data in order to help our clients streamline their operations, lower their liquor cost and boost profits. While we can automate certain aspects of the inventory process, such as sales reporting, by integrating our software with your POS system, counting is one part of the process that simply can’t be automated. It must be done physically, so we’re always looking for ways to make the counting go as fast as possible. Over the years, we’ve figured out some tricks to speed up the counting process while also ensuring the most accurate results possible. Some of these tricks are specific to the nuances of Bar-i’s software, but the vast majority of these tips can be used with just about any inventory system. Learn about our product positions and how they relate to counting inventory. If you have fewer products to count, then the counting process will go faster. Most bars follow the 80/20 rule. Essentially, 80% of your sales volume comes from 20% of your products. This leaves you with a lot of opportunities to eliminate products that are hardly ever ordered by your customers. In general, you’re better off having a smaller product selection that is carefully curated and which are used in creative combinations to make interesting drinks that will help distinguish your bar from your competitors. It’s also much easier for your staff to become knowledgeable about the products you serve when there is a smaller selection. As an additional benefit, it will be easier for your customers to choose a drink when you have a well-crafted beverage menu that your staff can speak intelligently about. Ultimately, smaller product selection will usually lead to a better customer experience. From an inventory perspective, this smaller product selection will make the counting process go much faster. For the average bar, keeping your selection around 200 products will place you in a strong position to deliver a good customer experience and expedite your counting process. However, you can also be very successful with a significantly smaller product selection. Every product is going to be kept behind the bar and in a backup location, but often we see two open bottles behind the bar or more than one storage area for each product when bars aren’t well organized. When your bar is poorly organized, it wastes a lot of time during the counting process. Unless you have multiple bars, you shouldn’t have more than twice as many counting locations as you have products. 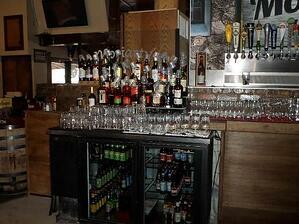 One of the most critical aspects of a well-organized bar is that products are always kept in the same place. Keeping items in the same place at all times will significantly streamline the counting process. When you count and weigh bottles in the proper order using Bar-i’s software, our mapping system will always record the counts on the proper line of the spreadsheet. There are many inventory systems that don’t use a mapping system. This requires you to either scan every bottle before you count it or look up each item in a (typically alphabetical) list. This slows down the process and results in a two-step process for every bottle you count (scanning the bottle and then weighing it). Bar-i’s mapping system reduces this process to one step (weighing the bottle). By keeping your bottles in the same order at all times and using inventory software with a mapping system, you can halve the number of steps in the counting process, which will save a significant amount of time. 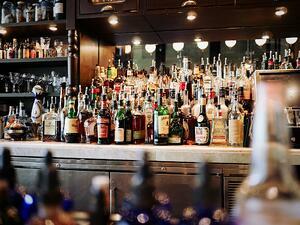 Over time, certain items may get moved to a new place behind the bar for various reasons. This is OK as long as the new location remains consistent. Some app-based systems will require you to manually type a product into the system when it is moved to a new location. This can be very time consuming. This requires numerous screen touches that will significantly slow down the process. If you have a barcode scanner, the process becomes much faster and more streamlined. All you have to do is scan the bottle and the proper product and size will immediately appear in the new counting location. The Bar-i barcode scanner is a small and inexpensive piece of equipment. We also keep it on a KEY-BAK device that can be attached to your belt. This ensures that the scanner is out of the way, but easy to access when you need it. Most importantly, you will always have both hands free to count when you’re not using the scanner. Our mapping system will reduce the need to use a barcode scanner, but whenever you add a new product or change the setup behind your bar, you’ll find that using a barcode scanner will significantly speed up your counting process. There’s no faster and more accurate way to add products to a new counting location. If you’re using two people to count inventory where one person is looking at the inventory and shouting the numbers to a second person who is recording the information, you’re using a very inefficient counting process. When you use two people to count inventory, you’re doubling the amount of manpower used for this task and therefore doubling your labor cost associated with counting bottles. In addition, the talking that occurs between staff members will slow down the process. If you carry a lot of products and have 600-800 product positions, it will take a very long time to get through your inventory counts using two people. This would actually speed up the counting process since you would be taking a “divide and conquer” approach with two staff members. But if both employees are working in tandem on counting the same products, it’s a sign that you’re using an inefficient system that is actually slowing down the process. While we stress the importance of staying very well organized, we acknowledge that there are certain circumstances where this level of organization simply isn’t practical. For example, it is common to have a collection of 6-10 shot bottles such as Jägermeister, Rumple Minze, Fireball and other products that are typically served cold stored in a freezer. The same products will always be stored in these areas, but they generally won’t be kept in the same order all the time. 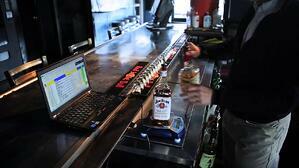 On a busy shift, bartenders will grab a bottle and replace it in the easiest open location to access. Utilizing this pull-out zone process will make counting these products much more efficient. It will save a lot of time and reduce the risk that a product count will be entered on the line reserved for a different item. When you get new deliveries, check them in and put them away before you start counting. Otherwise, you’ve just added another counting location to the process. Every time you add a new counting location, it requires you to scan the bottles into the system before you can count them, which will add a lot of time to the process. By putting bottles away in the storage area before you start counting, you will only have to perform an inventory count in the one location where all the backups are kept. Most bars have a liquor storage area for backup bottles, but it often makes sense to have 1-2 extra bottles behind the bar for some of the most popular products you carry. This prevents your bartenders from having to run to the storage room every time you finish a bottle of these popular liquor items. By mapping out this storage area behind the bar, your customers will receive faster service and your staff will be able to count inventory much more quickly. This is a clear win-win. Bar-i’s system requires you to weigh each keg every time you count inventory. If your kegs are stacked up on top of each other, it will be difficult to handle the kegs, identify what type of beer is in each keg and weigh each keg. 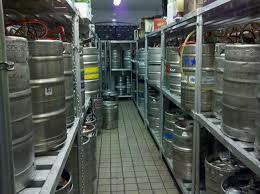 Therefore, it’s crucial that you keep your keg room organized in order to ensure a smooth counting process. This will help you avoid having to pick up each keg. 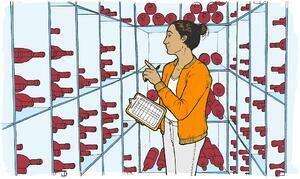 Using keg shelving will also allow you to minimize the movements required to weigh each keg. The tips discussed above will help you save a significant amount of time counting inventory regardless of the software you use, but they will pay even bigger dividends when combined with Bar-i’s inventory system. Our Speed Count system will significantly reduce the time it takes to count inventory. When you use our scales, mapping system and voice command software, your bar manager will be able to count each bottle in under two seconds. Our Speed Count Pro option utilizes the same counting system and will provide all of the same time-saving benefits as Speed Count. However, the Pro version of our software also compares your sales to your usage by writing recipes for every button on your POS system. This allows us to provide you with the detailed data necessary to improve your profitability. Regardless of which option you choose, you will also receive help with ordering. Each inventory period, we will generate an ordering guide based on dynamic pars that you set. This ensures that you will never run out of any products that you carry, and you also won’t be saddled with so much excess product that it clutters your storage room or ties up financial resources that can be used in other areas of your business. If you would like to learn more about how Bar-i can help you streamline your operations and maximize your profits, please contact us today to schedule a free consultation. We serve clients nationwide from our offices in Denver, Colorado.